I really have a hard time understanding, why you don't seem to be inclined to some form of thumbnail viewer. Your image viewer is amazing and blazing fast. But what's the use of all that prefetching, etc. if for navigation purposes, you always have to leave the FPV, open Explorer (or TotalCommander), switch to thumbnail view there, change the directory, see thumbnails there, etc. and go back to FPV ... ? Given that FPV is so fast, I'd strongly suggest you implement a thumbnail pane or thumbnail section or thumbnail bar or thumbnail window or something like that ... then you could really take advantage of that speed (1000 images/sec) to display the thumbnails. If you only display one single image at a time, what's the use for being able to grab the images so fast ? I agree with everything, the other guys said in the thread about thumbnails, that you locked. I have been using IrfanView, too. Just look at this program, it's so amazingly practical when you hit "T", instantly get your thumbnails of which you can choose another pic to view. I think in most of the situations you WON'T just browse one image after the other sequentially. I understand that it's quite a bit of coding work. But I'm certain, a lot of people would buy your program if it has this feature, because it would become their number one IMG viewer then, which is still thwarted by the lack of a thumbnail viewer. FastPictureViewer is a single image viewer by design, specificaly made to respond to a specific demand, which is to sequentially look at all the images in a large set to quickly pick the best from the rest. No more, no less, it's a specialized tool. Thumbnails are useless in this scenario, what is needed is full-screen, full size, full-fidelity view and excellent forward-moving speed, plus instant rating and copy/move. That's precisely what the program provides and other tasks, such as organizing, exploring or editing images, are left to other applications and as such there is no plan to add a thumbnail view to FastPictureViewer, it just does not fit. Since you mentionned a specific app, I see no practical difference between pressing T in that app (which brings a separate top-level window which laboriously fills a folder tree then paints thumbnails one by one) and pressing Ctrl+E in FastPictureViewer to bring up an Explorer window focused on the current image. i this question i am with boarders paradise - as you say axel the important thing is "quickly pick the best from the rest" if i like to pick the best of one motiv i always have a few of them and i have to see at one view if its 3, 5 or 7 or what else of them and where is the begin and the end of this motiv. so if i am actually looking at nr 5 and think that nr 1 was better i need fast to switch back to 1 and then again to 5 for example. I must be about the only one who understands Axel when he says he's not going to add a thumbnails feature (never say never, anyway). He sounds a bit stubborn sometimes, but in my opinion, he's right. The only way to have thumbnails load fast is by keeping them in a database, like ACDSee, Picasa and others do. Otherwise, you have to build them every time you open the thumbnail view, like irfanview does, taking quite a long time to load them, if there are many pictures in the folder and they're big. Taking care of the database (keep it updated, not corrupted, etc.) is not easy, you must keep it somewhere (pictures folder, app settings folder...), you have to build it some time (the first time you run the app, the first time you navigate to a folder)... It's a real burden. Now, Windows already has a built-in thumbnails view, which, from Vista on, is rather complete, and database based. You can see a lot of info about the pictures; you can resize the thumbnails, you can run your favorite viewer with a double-click... So, why bloat the software with something that's already in the OS? That said, I sometimes miss a thumbnail view too, because I'm used to it from having used it for years. 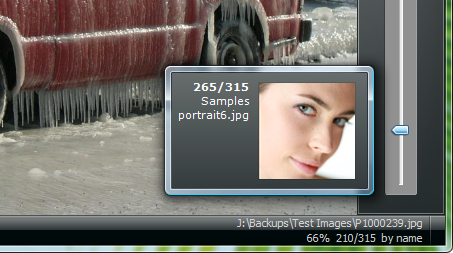 But I much rather have a program that loads quick and lets me review my pictures really fast. Anyway, if I ever need the thumbnails, I can run any other program that uses them. I guess this will be an endless discussion, and every now and then someone will come with "why isn't there a thumbnail view? ", so here's my opinion. After all, everyone has his/her needs, so this program, as well as any other, will be useful to some and useless to some others. That's life. I personally find it awesome, and I really think that a thumbnail view wouldn't make it any better. This new feature will not be available on XP as it uses Vista-specific functions. Preview thumbnail is good idea, but i think some features will still need to improve. If I through a photo directory with many subdirectories (a total of one thousand photos), so the problem is to find specific subdirectory or photo. One are where several other images viewer have made a mistake, i feel, is where the thumbs are stored/cached. It seems that you refer to a version of Windows that was released nearly 10 years ago and that was superceeded twice. 100'000 thumbnails in a database is nothing on a 2009 PC running a 2009 OS.